In one of his recently syndicated "My Answer" question-and-answer columns, world-renowned evangelist Billy Graham was asked why God sometimes says "no" to certain prayer requests even though He loves all of His children. 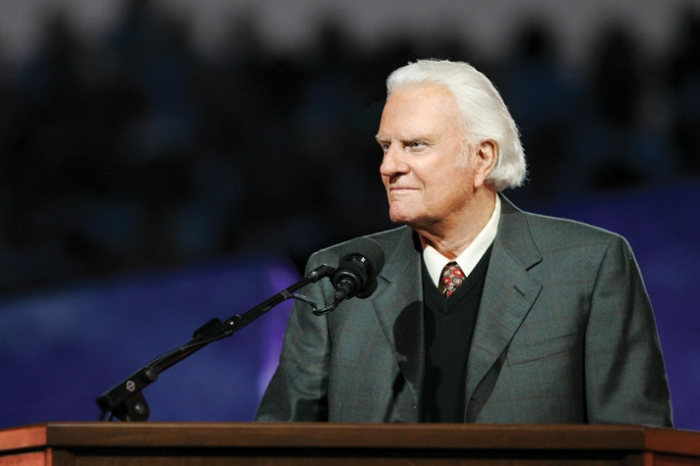 "Dear Billy Graham: I know God sometimes says 'no' when we ask for something in our prayers. But if He really loved us, wouldn't He always answer our prayers with a 'yes'?" the letter from a woman identified only by her initials of G.H. asked. The 96-year-old Graham, the founder of the Billy Graham Evangelistic Association, compared God and His denial of certain prayer requests to a parent who says 'no' when their kids ask if they are allowed do something that is unsafe. "Let me assure you that God does love us, and precisely because He loves us, He sometimes says 'no' to what we request in our prayers," Graham wrote. "Let me explain it this way. Elsewhere in your letter, you mention that you and your husband have two children. Do you give them everything they ask for? Or if they want to do something you know is dangerous, do you let them do it anyway?" "No, of course not, and the reason is because you love them and don't want anything bad to happen to them," Graham continued. "Part of your responsibility as a parent is to protect your children from harm even if it sometimes means saying 'no.'" Graham further explained that God is much like a protective mother or father and wants to keep His children away from harm. Although a person might not see the consequences of His desires while praying, God is all-knowing when it comes to what is best for His children, Graham stated. "In a much greater way, God loves us and knows what is best for us — far more than we do. And because He wants to keep us from harm, He sometimes says 'no,'" Graham asserted. "As I look back over my life, I know God sometimes said 'no' to things I asked him to do, and to be honest, I often was disappointed. … But later I realized God knew what He was doing, and by saying 'no,' He had kept me from harm." Graham tackled a similar question in one of his "My Answer" columns published around the end of March. He explained that when God has said no to a prayer request, the person should stop asking God to make that request a reality. "But sometimes God answers our prayer with a definite no, and when that's the case we shouldn't keep begging him or demanding He give us a yes," Graham stated. "How can you know if God has said no to your prayer? Begin by asking yourself why you've prayed this prayer. Are you honestly seeking God's will in this situation, or are you only concerned about yourself and what will please you?" Graham also wrote that prayer is "one of our greatest privileges," but that doesn't mean that it opens the door for God to fulfill everyone's earthly requests. "Prayer is one of our greatest privileges, and it's possible because Jesus Christ has opened heaven's door for us through His death and resurrection. But prayer isn't just asking God to do anything we want," Graham argued. "Begin by committing your life to Christ. Then make it your goal to seek His will in your prayers."